This image na-1406-48 is used with the permission of the Glenbow Archives and shows the men portaging around a difficult rapid, carrying packs and hauling the York Boats with the use of rollers. So, let’s continue our journey down the Athabasca River from Athabasca Landing, heading toward Fort Chipewyan, on Athabasca Lake. That is the first major stop, for the HBC men at least. The last stop is the Klondike gold fields. You might ask why I have a portage picture here: the first obstacle on the Athabasca River was the Grand Rapids! 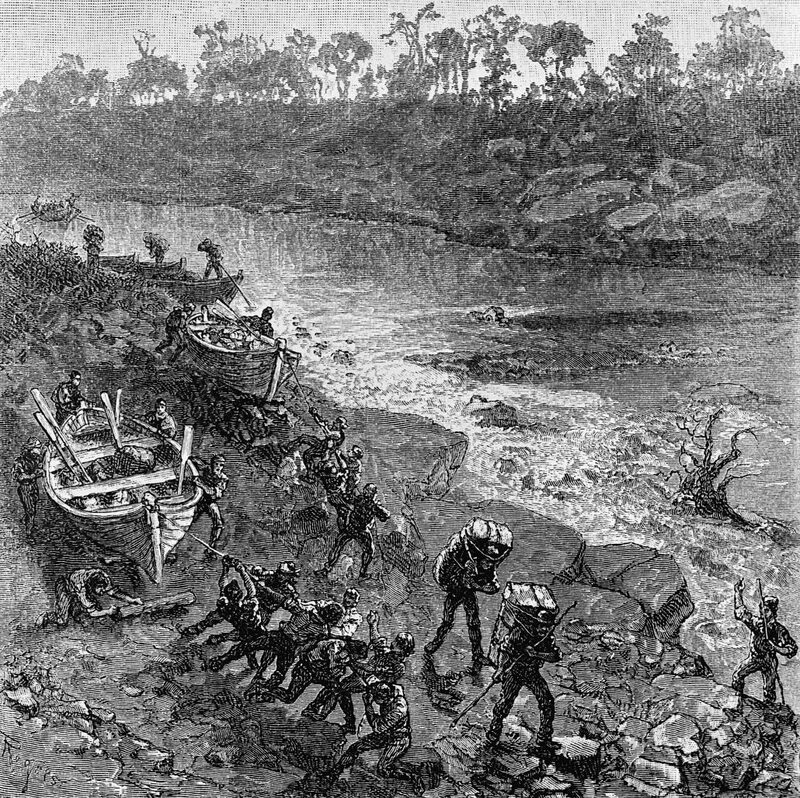 Supposing we have our boat, and our supplies on board, with a crew of six or seven men, we push out at the Landing and start DOWN stream for the Yukon. Leaving the Landing we proceed down the Athabasca 167 miles to the Grand Rapids. This part of the navigation is accomplished without difficulty, as the Hudson’s Bay Company’s streamer runs up and down at all stages of water. Grand Rapids to Fort McMurray, 87 miles: The first half mile [of the grand Rapids] is a bad rapid, where it is necessary to carry all supplies and let the boat down by water with a rope. From the lower end of this portage there are no obstructions, and the remainder of the rapids, 87 miles to [Fort] McMurray, can be run with ordinary care. As you know from the first in this series, found here: http://nancymargueriteanderson.com/klondike-trail/ — John Work and Peter Skene Ogden arrived on the Athabasca River by the “Biche River,” which flows out of Lac la Biche. It flows into the Athabasca west or south of the Grand Rapids. But most HBC men who were heading north to the Athabasca District came to the Athabasca River by the Clearwater River, which is north of the Grand Rapids. English-men explored this river, and so too did the Nor’Westers and HBC men. Some left good descriptions of their travel, and so I will include their journals in here. Peter Pond was the first fur trader to come here. He set up his post north of modern-day Fort McMurray and close to Athabasca Lake, but I don’t have his journals. This river [the Clearwater], which waters and reflects such enchanting scenery, runs, including its windings, upwards of eighty miles, when it discharges itself in the Elk River, according to the denomination of the natives, but commonly called by the white people, the Athabasca River, in latitude 56.42 North…At the junction or fork, the Elk River is about three quarters of a mile in breadth, and runs in a steady current, sometimes contracting, but never increasing its channel, till, after receiving several small streams, it discharges itself into the Lake of the Hills [Athabasca Lake], in latitude 58.36 North. At about twenty-four miles from the Fork, are some bitumenous fountains, into which a pole of twenty feet long may be inserted without the least resistance. The bitumen is in a fluid state, and when mixed with gum, or the resinous substance collected from the spruce fir, serves to gum the canoes. In its heated state it emits a smell like that of sea-coal. The banks of the river, which are there very elevated, discover veins of the same bitumenous quality. At a small distance from the Fork, houses have been erected for the convenience of trading with a party of the Knisteneaux who visit the adjacent country for the purpose of hunting. Obviously the “bitumenous fountains” are the tar sands, which run some hundred miles along the Athabasca River. The house at the Fork, mentioned by Mackenzie, was Fort of the Forks, built by the North West Company in 1790 on the west bank of the Athabasca near the mouth of the Clearwater. It was succeeded by Fort McMurray, built by the HBC on the east bank of the river and at the head of navigation on the Athabasca River. The fort was succeeded in turn by the town of Fort McMurray, which sits smack in the middle of the tar sands. For a few years, Fort McMurray was called McMurray, as you see above. We made very slow progress after leaving this party, on account of the deep snow, but continued along thee river until we reached its junction with the Athabasca, or Elk River. We obtained observations on an island a little below the Forks…Very little wood has been seen during this day’s march. The western shore, near the Forks is destitute of trees; it is composed of lofty perpendicular cliffs, which are now covered with snow. The eastern shore supports a few pines. March 18. Soon after our departure from the encampment we met two men, from the establishment at Pierre au Calumet, who gave us correct information of the situation and distance. Having the benefit of their track, we marched at a tolerably quick pace and made twenty-two miles in the course of the day, though the weather was very disagreeable for travelling, being stormy, with constant snow. We kept along the river the whole time: its breadth is about two miles. The islands appear better furnished with wood than its banks, the summits of which are almost bare…Early the next morning we sent forward the Indian and a Canadian, to apprize the gentlemen in charge of Pierre au Calumet of our approach; and after breakfast, the rest of the party proceeded along the river for the station, which we reached in the afternoon. Mr. John Stuart was in charge of the post, the senior partner of the North West Company in the Athabasca Department…This house receives its name from the place where the stone is procured, of which many of the pipes used by the Canadians and Indians are made. It is a clayey limestone, impregnated with various shells. The house is built on the summit of a steep bank, rising almost perpendicular to the height of one hundred and eight feet, and from it an extensive prospect is commanded along this fine river, and over the extensive plains which stretch out several miles at the back of it — and are bounded by hills of considerable height, which seem to be better furnished with wood than the neighbourhood of the fort, where the trees grow very scantily. There had been an establishment belonging to the Hudson’s Bay Company on the opposite bank of the river, but it was abandoned in December last [1817 or 1818], on account of the residents not being able to procure provision from their hunters having been disabled by the epidemic sickness, which has carried off one-third of the Indians in these parts. The rest of the party set off afterwards, and kept along the river until ten, when we branched off by portages into the Embarras River, the usual channel of communication in canoes with the lake. It is a narrow and serpentine stream, confined between alluvial banks which support pines, poplars, and willows. We fortunately got a glimpse through this cloud [of flying snow] of a cluster of islands in the direction of the houses, and decided on walking towards them; but in doing this we suffered very much from the cold, and were obliged to halt under the shelter of them, and await the arrival of our Indian guide. He conducted us between these islands, over a small lake, and by a swampy river into the Athabasca Lake, from whence the establishments were visible. At four P.M. we had the pleasure of arriving at Fort Chipewyan, and of being received by Messrs. [?] Keith and [Sam] Black, the partners of the North West Company in charge. Thus has terminated a winter’s journey of eight hundred and fifty-seven miles, in the progress of which there has been a great intermixture of agreeable and disagreeable circumstances. Could the amount of each be balanced, I suspect the latter would much preponderate; and amongst these the initiation into the practice of walking in snow-shoes must be considered as prominent. Mad dogs and Englishmen! I can understand how John Franklin got into the many difficulties he did. Some of his men did not survive this journey! Sunday 10th [August]. Head wind. thunderstorm with flashes of lightning and tremendous fall of rain throughout the night. The water being shoal, we did not start before four o’clock. Arrived at the Grand River Athabasca, which we found “good water.” Fine runs along the river. Passed Red River and the Little Hills opposite at half-past ten o’clock. Passed the Bituminous Springs on right, about noon, and reached Pierre au Calumet (pipe stone), on the left hand at two o’clock. Had the pleasure of passing this afternoon on board with the Governor. About four o’clock a heavy dark cloud in the south-west indicated the approach of a storm which, in a few minutes, poured down upon us in hail stones of at least the size of a small pistol ball, and continued for about twenty-five minutes. The evening wet, cold, and chilly. Encamped on Poplar Point. Large strata of Pit Coal all along either side of the River. Not an Indian on this communication, and strange to say, not even the appearance of an animal. Monday 11th. Started after three. Breakfasted at eight, about nine miles above L’Embarras, which we passed at half-past ten, leaving the old fort of Mr. Ross nearly opposite on the right hand. At one o’clock, White fish Creek on the right. Did not enter Athabasca Lake before five. Crossed with the poles. Strong head wind. Changed [ie. dressed for arrival in proper trim] on Coal Island, and arrived at Fort Chippewyan by seven, where we found Mr. William McGillivray…The Indians were much pleased to see their old trader, Mr. Simpson, once more among them. It is just a month since we left York Factory. New, but very small potatoes. Mackenzies River, which is the only District on the East side of the Rocky Mountains now susceptible of extension of Trade, is becoming more valuable every succeeding year; and altho’ the most distant from head quarters, none can boast of a more perfect system of management than its affairs exhibits. Its Posts at present are, Fort Simpson at the Forks of Liard & McKenzies Rivers, Fort Nelson on the upper part of Liard River, Fort Norman on the Main River (McKenzies) between the Forks and Great Bears Lake River, and Fort Good Hope near the borders of the Esquimeaux Lands on the Main River Likewise. Fort Simpson is frequented by the Rocky Mountain Indians and part of the Dog Rib Tribe, who are considered the home guards, and by the Umbahatonies and Nahanies, who inhabit the Mountains; and has lately been visited by the Toohechotanies, who inhabit a Country altogether beyond the great chain of Rocky Mountains, which they represent a different in character altogether from that on the East side, consisting, of fine plains intersected by gentle Streams and studded with clumps of Wood, abounding with large Animals say Buffalo, Moose, Rein Deer &c, and Rich in Beaver. Of these different Tribes, about 300 young and old visit the establishment, and bring about 70 packs of Furs amounting to between 5 & 7000 pounds [Sterling]. Fort Nelson is frequented by about 100 Rocky Mountain Beaver Indians, who Trade about 45 Packs Furs, value between 3 & 4000 pounds [Sterling]. Fort Norman is visited by part of the Dog Rib and Hare Indians, who bring about 16 packs value from 12 to 1500 pounds [sterling]. Fort Good Hope is visited by the Rapid and Leau Cheau Indians, and part of the Hare Indians, about 170 in all, who trade about 50 packs Furs, value from 2500 to 3000 pounds [sterling]; making the returns of the Four Posts about One Hundred and Eight Packs Furs, value Thirteen Thousand Pounds…. Peel’s and Vermillion Rivers, falling into the McKenzie, are still unexplored, but measures are taken to have them examined, and ’tis probable they will be soon settled as the Indian reports are favorable both as to the Country & navigation. So you see where we’re going with this? It will be fun.